-ExecutionPolicy Unrestricted -Command "& C:\Scripts\MyScript.ps1"
I run it as an admin user and also tried "run with highest privileges" checked. That did not help either. When I run the task and then start the program manually, it results in two separate processes with the same name but different handles. Usually only one instance of the program can run. This is apparently a problem with the task scheduler, since the script works fine if run manually. Can anyone help me here? I have run into what sounds like a very similar issue. Normally the application I had this issue with would open and begin processing a queue of files. In this case, as you described, it would sit completely idle when run from a scheduled task. Ultimately what worked was a batch file called from the scheduled task that then called the .ps1 that launched the .exe. The lines in the batch file look like below and is called from the scheduled task with settings matching your description. LaunchProcess.ps1 in my setup contains a standard start-process for the exe. I haven't used this past 2008r2 server but I imagine works all the way up current. 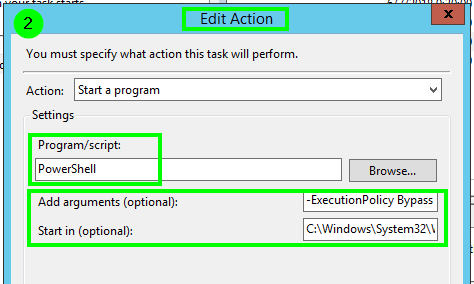 Task Scheduler - how to run powershell script with multiple parameters?